"The purpose of my work is to show the essence of things, what we don't see but sometimes perceive...that which lies beyond matter." Viewing a painting by artist Fany Mares can be a profound experience. We may sense that something essential is flowing through the subject. And we may find ourselves asking: Where is it flowing from? What is its source? Can we perceive its flow within? Mares achieves a unique effect by embedding her subjects in light, intense color, rich texture, and flowing, moving lines. Reporters and independent observers note that much of Fany Mares’ art goes beyond detail, tangible matter, and the material level to the inner nature, deeper meaning, and essence of things. Her horses ripple with strength, grace, and freedom. Her female figures convey inner peace and calm self-esteem. And even her landscapes and trees reflect a numinous light and essence. Mares admires Michelangelo, Van Gogh, and David Alfaro Siqueiros for their passion. She loves how Michelangelo gave his work “life essence,” how Van Gogh used intense color and movement and made everything flow and come together as a whole, and how Siqueiros worked with textures and gave his work movement. The influence of all three artists can be seen in Mares’ work. In showing the relationship between her subject and the space that surrounds her subject — the connection between matter and essence — Mares has made use of the golden spiral. The golden spiral adds direction and depth to her paintings and helps hold the moving elements of each painting in a unity, wholeness, and harmony. Fany Mares was born and raised in Mexico City. Fany’s father, who liked to paint, passed away when she was five. She began actively painting a couple years later, and her father’s brother Alberto and other relatives encouraged her in her painting. By junior high school (in Mexico City), Fany was taking art classes, and she continued to do so in high school in Houston, Texas. Fany studied 2 years in Universidad de las Americas, and majored in design at Universidad Nuevo Mundo in Mexico City. Since the 1990s, in addition to her painting, Mares has been a freelance designer. She’s designed logos, brochures, and posters, and done other business-image work. Over the years, Mares has taken several workshops in art, sculpture, and stained glass. Mares lives and works from her home studio in Texas, where she is also raising her children. 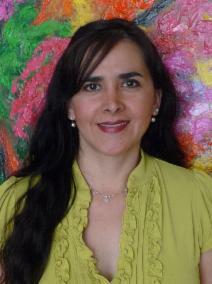 Mares has displayed her paintings in the United States, Europe and Mexico. She recently made an exhibit called “The Colors of Mexico” in the National Historic Museum of Albania. In the future, Fany Mares intends to keep creating paintings that reflect her perception of the world. We can count on her to keep searching for that perfect state where the essence of the subject comes together with that deeper essence that surrounds us all.